And here we are, at the catalyst for this whole project. I need not say anything about the quality of the workout, because you already know that Ram is fun and motivating. 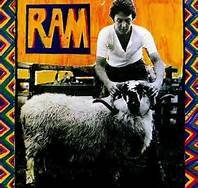 The adorable “Ram On” on which Paul accompanies himself on ukulele, “Uncle Albert/Admiral Halsey,” which you will have to hear for yourself, and “Smile Away” (crank up the bass!) really make me work up a sweat. I hope by now you all have your Ram CDs, or whatever we’re up to now. Remember, I’m still on albums. This is actually billed as Paul & Linda McCartney, and you hear her singing back-up. I like them together, and will continue the discussion from yesterday on why I like Paul. Before I cancelled the premium channels last year because, well who doesn’t get annoyed with Time Warner Cable, I saw a movie called Nowhere Boy about John Lennon’s life just prior to the Beatles, in which Paul played a pivotal role. John’s cheekiness was not so engaging as he came off as selfish and combative. And then I saw the two-part Martin Scorsese documentary George Harrison: Living in the Material World, which I HIGHLY recommend for anyone even remotely interested in the Beatles. Again, Paul seemed to be the voice of reason, and George had admitted that if it wasn’t for Paul, Let it Be never would have been made because everyone else was too high. And just recently while researching the meaning of “Hey Jude,” I read something from Julian Lennon, John’s son from his first marriage. Paul had not written the song about John and Yoko Ono, for whom John had just left his first wife, as John and many of us thought. The song was originally titled “Hey Jules,” and Paul had written it to comfort Julian, who only learned that fact decades later. Julian recalls that in those days, Paul would come to visit him and his mother out of concern, and that he saw much more of Paul than he saw of his own father. I don’t want to turn this into an ode to Paul McCartney, but I just like the guy. Ram is now being displayed in one of the album frames I got for my birthday, but I’ll bet it comes out before we’re done with the M’s.